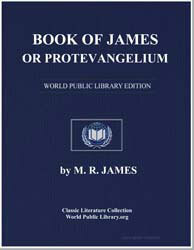 Excerpt: Origen mentions the Book of James (and the Gospel of Peter) as stating that the ? brethren of the Lord? were sons of Joseph by a former wife. This is the first mention of it, and shows us that the book is as old as the second century. To collect later references to it is unnecessary. It is generally agreed that the story of the death of Zacharias (chs. xxii-xxiv) does not properly belong to the text. Origen and other early writers give a different account of the cause of His death: it was, they say, because, after the Nativity, he still allowed Mary to take her place among the virgins in the Temple.